I loved this marathon post, thanks! It IS amazing how hard a marathon can feel! Sounds like you had a fun time which is what is most important! Detroit is on my “todo” list but it is always the same weekend as the GR marathon which is basically in my backyard – hard to pass that up. I’m going to go digging through some of your old posts to see if I can find the answer, but if you have any recommendations for a good Saucony racing shoe, I would be very grateful. I just won a gift certificate for a free pair of Saucony’s and have never had racing shoes. Good luck with your PhD work! I’m sorry you didn’t get that PR, but OMG, that time is awesome and super fast! I would love that time!! I’m sorry you were having pain, but you didn’t quit! You pushed through the pain and finished! Yay! Megan, you rock! Thanks for sharing your race report even with Phd work on your plate. Your report reminded me of my marathon. Ouchy. But you still did ” SO GOOD!” 🙂 I was right against the rope in wave B. I bet we were right by each other and didn’t even know it. I also missed mile 1, but probably for the better. I might have scared myself with the pace! 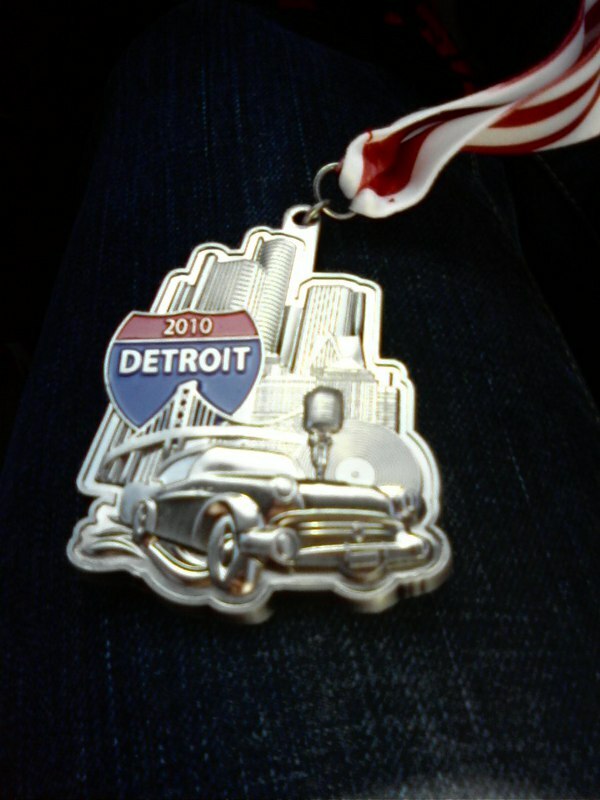 love that medal! 🙂 Great report! Way to hang in there!! !